Over the weekend, Russian Muslims celebrated one of their major religious holidays, Eid al Fitr, which is also known in Russia as Uraza-bairam (in the Tatar language). According to the last population census, there are around 14.5 million Muslims in the country, forming about 10 percent of the population. 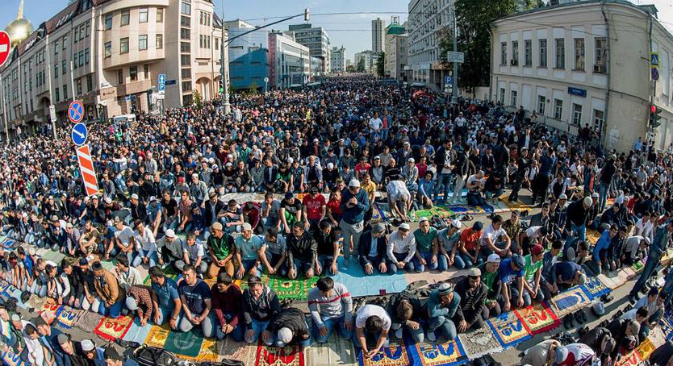 More than 200,000 Muslims celebrated Eid al-Fitr in Moscow on July 17. It was especially crowded in the city center near the mosque on Mira Avenue. Eid al-Fitr is celebrated to mark the end of one of the most challenging periods of the year, when Muslims fast for 40 days. After dawn prayers on the day of Eid al-Fitr, Muslims spend three days celebrating Eid, enjoying gourmet foods and desserts. Instagram users in Russia posted congratulatory messages with pictures of delicious food. After Eid prayers, Russian Muslims gather in their houses to taste traditional food and exchange gifts with relatives. This image shows a Tatar style celebration in Tatarstan, one of the several Muslim-majority areas in Russia. One of the traditional Eid dishes in Russia is manty, which are very similar to pelmeni. Gifts should also be traditional and symbolic. Muslim girls from Ufa, the capital of Bashkortostan, where the BRICS summit took place, shared a photo with wishes of world peace. This is how a traditional Russian Muslim meal looks like. Among the most common gifts for the holiday in Russia are shawls and hijabs.